Unlucky﻿ for some, but I've actually made it to edition 13 of the Railwaymedia Blog! As promised from the last posting, this will be mainly a 'trip review' of last Friday's jaunt to Scotland. In common with previous days out this was mainly centered, or at least planned around, visiting various Wetherspoons in the area. OK, not to everyones taste, but they are always cheap and you rarely get a bad pint in one (though as it turned out, in Scotland sometimes you can't actually get a pint in one at all before mid morning). For anyone that's interested, there are currently 849 Wetherspoons establishments in England, Scotland, Wales and Northern Ireland. I'm only a beginner having so far visited about 180, but there's plenty of time. John Adams has visited most of them and has a comprehensive list of them HERE. So on to the day out and with 20 minutes at Glasgow Central for the train to Kilmarnock it was time to visit the first 'Spoons' for a quick pint. Only it turns out that in Scotland, or at least in bits of it, you can't have a pint before 11 unless you're having breakfast. Apparently a breakfast sandwich doesn't count. So it had to be a quick coffee before the train for the pleasant trip south. Why can't they make modern trains like the 156s are, light, airy, comfortable with nice big windows?! After a few photographs at the station it was a quick visit to the Lloyds No.1 Bar just round the corner. As it was only 1030 we suspected the 1100 beer rule may apply here too, so checking as we walked in it was amusing to see all the old blokes nursing mugs of coffee rather than pints of beer. So it was another coffee and a second bacon sandwich before the train to Ayr. 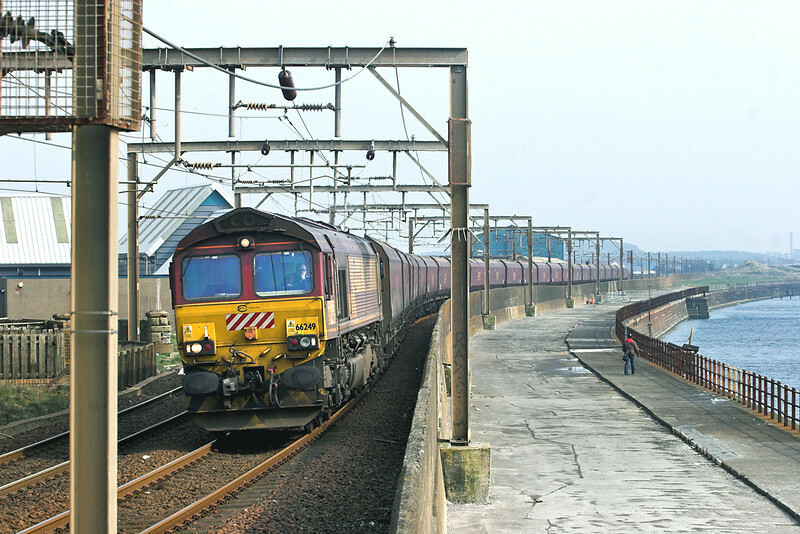 As we had overtaken a coal train at Barassie we got off at Prestwick Town for 20 minutes in the hope of a picture, but it must have gone into a yard before it reached us because it never appeared. This put us an hour behind our initial schedule but ironically this gave us more time for photography at Saltcoats, though not before a quick visit to the Ayr branch of Wetherpoons for the first pint of the day. 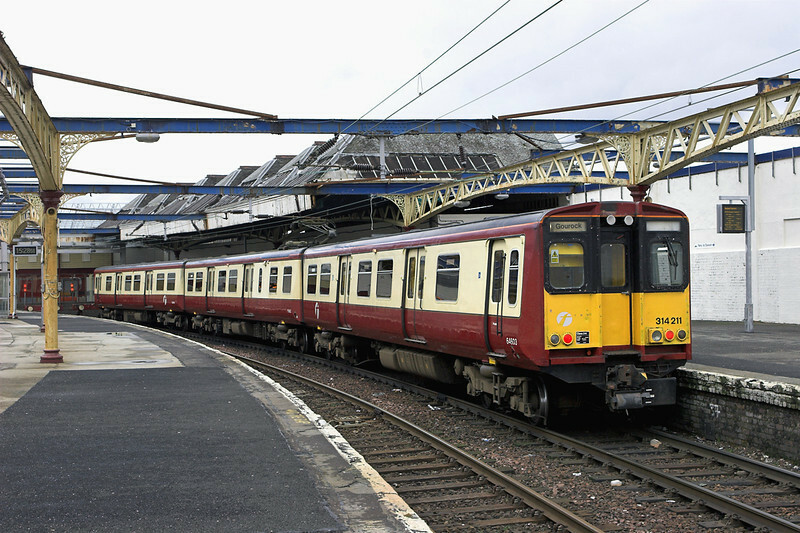 Saltcoats, which is on the Ardrossan and Largs line, required a change of trains at Kilwinning. There is a short section where the line runs along the coast. I have visited here a few times as the line carries the coal trains to and from Hunterston. We had only just arrived when 66249 appeared. Due to the strange nature of the line north from here we concluded there would be no more freight. Just after Saltcoats the line to Largs in effect becomes two single tracks. 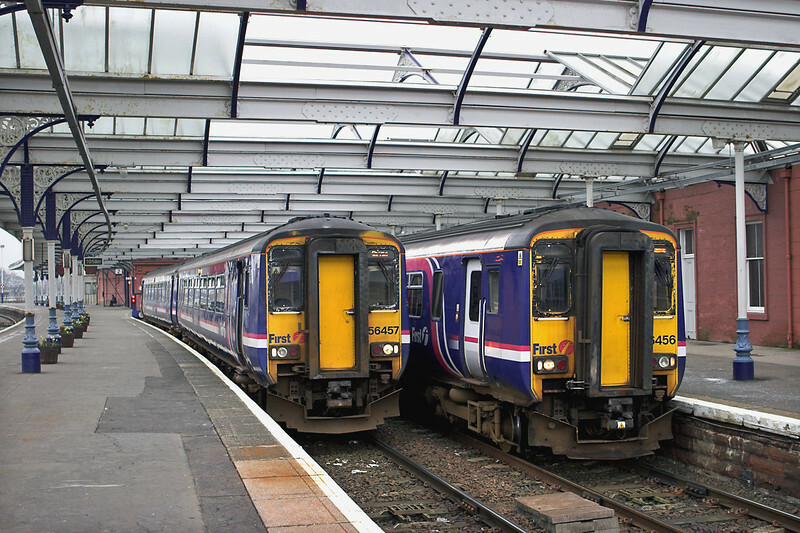 One carries traffic in both directions, freight to Hunterston and the hourly passenger service to and from Largs, whereas the other, as it has no platforms or overhead wires, can only be used by freight coming out. We got the next train to Largs, where from the bus stop outside a regular service takes you towards Greenock. 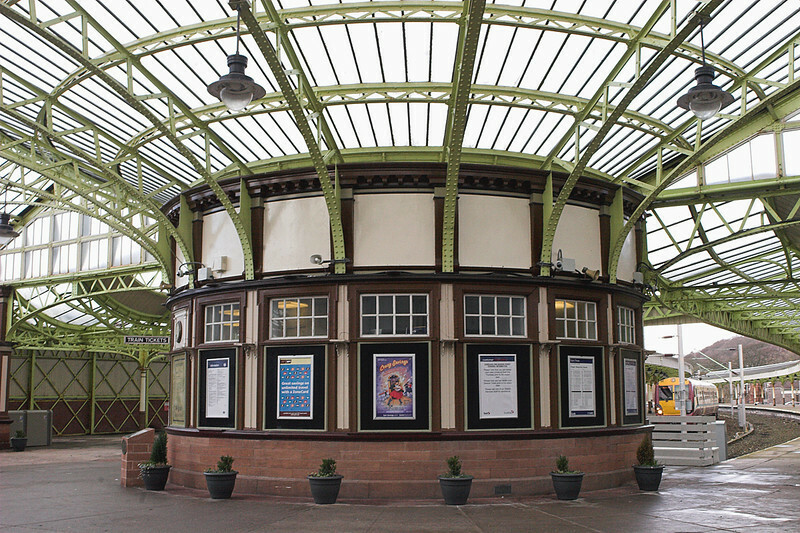 Having already done this journey a few years ago I knew it was less than 10 minutes on the bus before it passed the excellent station at Wemyss Bay, which is well worth a visit as it must be one of the nicest stations in Scotland. Time was tight so we stayed on the bus, though had I remebered the station had an excellent cafe and bar inside I may have been tempted to stop off. 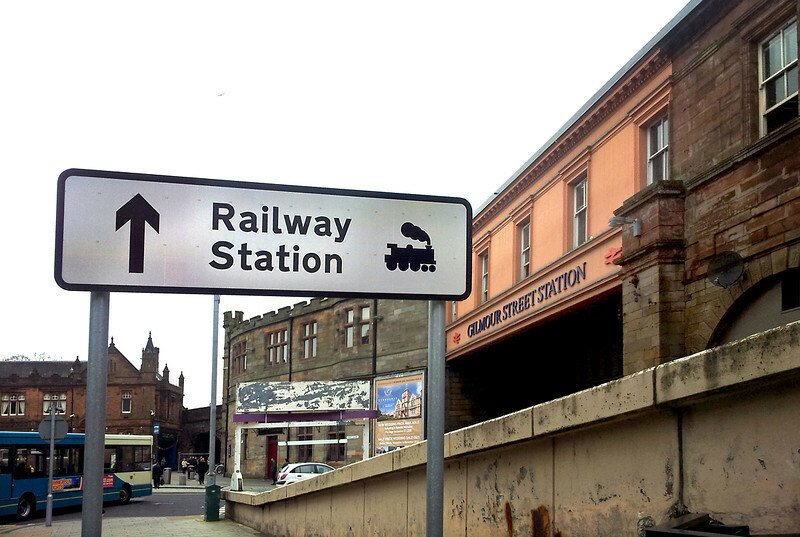 Instead, it was onto Greenock which, based on just a quick visit, doesn't appear to have too many redeeming features. The bus station is a long walk from Greenock Central station and it's not very obvious the best way to get there. As Tim hadn't ever done the line to the terminus at neighbouring Gourock we caught the train there. I was last there in 2009 when the station was in a very run down state. What a shame though they couldn't restore the old buildings and roof; instead they have knocked it all down. Yes the platforms are cleaner and neater, but the unpainted metal overhead stanchions really don't add to the ambience. Here's the comparison, two years apart. With the weather now distinctly dull, and of course getting darker earlier as the clocks hadn't gone forward by then, we headed to Paisley to wait for a bus to the somewhat out the way Wetherspoons located by a leisure centre at Braehead. And wait we did. The ticket we were using (Strathclyde PTE's Day Tripper ticket) whilst valid on all rail and underground services, also some ferries, is only valid on certain bus operators, of which McGill's of Barrhead isn't one of them. McGill's seems to run most of the bus routes around Paisley, some in competition with Arriva (who did accept the ticket), so we had to let several McGill 26's go and wait for an Arriva one. The ten minute service wasn't acting as if it was every ten minutes. We waited ages until one appeared. We found out later though the possible reason, as from this week McGill's have bought Arriva in Scotland. Our guess is the Arriva drivers were out on a final Friday piss-up. I remember many years ago hearing of McGill's coaches, indeed I seem to remember owning an EFE model of one of their Leyland National's (a rare choice of vehicle for a company in Scotland). It appears the original McGill's sold out to Clydeside Buses in 1997 which in turn was bought out by Arriva. Arriva then sold some of the services off again and the new company was called McGill's (with about 30 buses). It has since grown to own 190 buses, and has now taken over the rest of Arriva Scotland's services, so will gain another 200 buses! Anyway, suffice it to say we spent a non too exciting 40 minutes in an underpass beneath a Paisley Car Park waiting for the right Arriva bus to turn up and so slowing down our beer intake. Well I think that's enough waffle for this blog; I am hoping to head off with my camera tomorrow, providing the good weather holds, so I will of course keep you updated. Thanks again for reading, I'll leave you with the only thing that brightened up my time waiting for a number 26 bus. 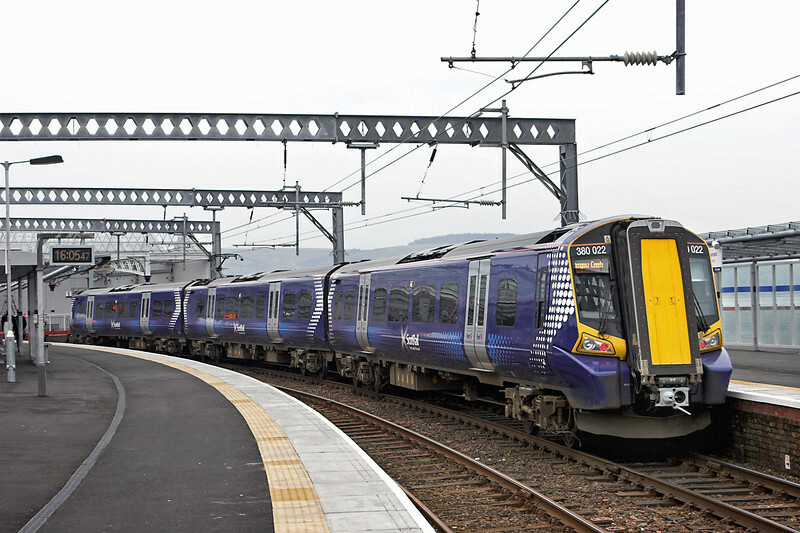 It's also proof that the Paisley Highways Department haven't heard about Scotrail's investment in class 380's!